TruStrip RDT technology is based upon the time-tested and well-established lateral flow immunoassay technique that is designed and packaged in a manner that make it smart, visual, reliable and cost-effective. The key design features and functional benefits TruStrip RDT technology are detailed below. 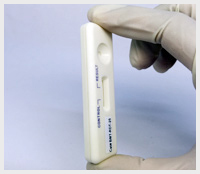 Individually Packaged Test Cartridges - Practically every diagnostic test require the assurance that the product is tamper-proof and has not exposed to any contaminating material. Each and every TruStrip RDT cartridge is individually packaged and labeled to assure that the test device is in pristine condition prior to use. Cartridge Design - The design of any test cartridge is an important factor in being able to use the cartridge in a convenient and comfortable fashion for performing the test. This is particularly important when performing the tests in field environment. Every TruStrip RDT cartridge has the following design features that make it ideal for field use and standard applications. Each cartridge is wide enough so that it is easy and comfortable to physically hold the cartridge while performing the test. 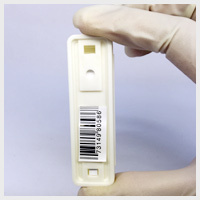 The width of the cartridge also allows plenty of space to apply barcode labels or applying any other identifier labels. The sample application well in every cartridge is large and deep so that it can accommodate an ideal volume of sample for proper migration into the test area of the strip. 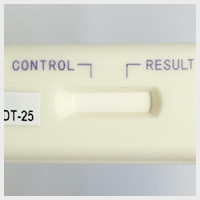 The test window in every cartridge is clearly marked with "T" and "C" letters that indicate the position of the reaction lines for test and control. This makes it easy to clearly identify positive results and more importantly, identify invalid test such as having a test line appear without the control line. 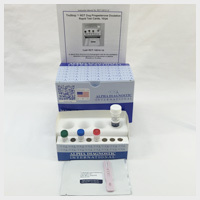 Detection Reagents - TruStrip RDT technology uses the well-established colloidal gold-conjugated reagents that require no additional steps or reagents to produce the reddish-brown colored test lines. This strong signal produced by this detection method enables clear interpretation of the test results in a rapid manner. Mobile Test Platform - In additional to the individually packaged test cartridges, every TruStrip RDT test kitcontains all the reagents and accessories needed to perform a test. 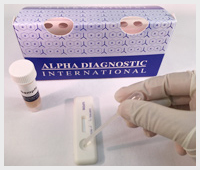 This means rapid tests can be performed anywhere, anytime - even in the field or remote locations with no access to proper laboratory facilities. In this aspect, the TruStrip RDT technology is a true "mobile test platform". When combined with TruStrip STS sample collection and storage solution, the overall possibilities expand vastly! Lastly, the TruStrip RDT test kit package containing all the reagents and accessories makes it a true "mobile test platform" that can be used in any environment - including remote areas or in the field. All the above features and benefits make the TruStrip RDT product Smart, Visual, Reliable and Cost-effective rapid-test technology.